Welcome to the August 2009 issue of the Global Washington newsletter. If you would like to contact us directly, please email us. Spotlight: Global Washington Premiering New Website! I am tremendously excited to announce that we have confirmed Nicholas Kristof as our keynote speaker for the Global Washington Annual Conference to be held Monday, December 7 on the Microsoft Campus in Redmond. In their new book, Half the Sky: Turning Oppression into Opportunity for Women Worldwide, Nicholas D. Kristof and Sheryl WuDunn share stories of women’s struggles in the face of poverty . Half the Sky brings attention to the fact that women make up more than 60 percent of the poorest people on earth, yet hold the potential to change the world as we know it. If you have not seen last Sunday’s New York times special section on women and development, be sure to review some of the articles. I really look forward to seeing you at the conference. Over the next two months we will continue to send you links to Nick Kristof’s writings and thinking to help us all prepare for a very fruitful conversation with him. We will send an announcement out to let you know when registration for the conference has opened in mid-September. Our goal for this conference is to motivate and activate the private, non-profit and philanthropic sectors jointly to build the next chapter of our common global future. Together, we will generate specific goals to advance global development in Washington through collaboration between the private, non-profit, government and academic sectors. I hope to see you all there. Global Washington is sad to announce the death of one of it’s founders. Lance LeLoup, who retired in June after a distinguished career in political science research, teaching and administration at WSU, died Thursday, July 23, at his home on Whidbey Island. He was 60 and had been suffering from cancer. Lance T. LeLoup was the Vice Provost of International Programs and Edward R. Meyer Distinguished Professor of Political Science at Washington State University. In 2007, he received the Aaron Wildavsky Lifetime Achievement award for Research on Public Budgeting from the Association for Budgeting and Financial management, the largest section of the American Society for Public Administration. Dr. LeLoup received a B.A. from Georgetown University with honors and M.A. and Ph.D. from the Ohio State University. 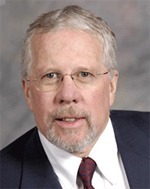 He was at WSU since 1996 where he previously served as Chair of the Department of Political Science and Director of the Thomas Foley Institute. He is the author of more than a dozen books and sixty articles on politics and public policy in the U.S. and Europe particularly in the areas of legislative institutions, executive-legislative relations, and public budgeting. 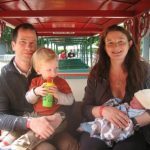 Professor LeLoup had faculty appointments and lived in England, France, Hungary, and Slovenia, and lectured around the world. In 2007 Dr. Leloup joined other academics in recognizing the value of collaboration and help found Global Washington and worked on the development of the Global Learning Goals. He served on the global education advisory committee and the steering committee of Global Washington in the last two years and was instrumental in the development of the organization. We will miss Lance deeply. Please click here to read more about Dr. Leloup’s life. Global Washington is putting the final touches on a fantastic re-design of our website, which we’ll officially be launching next week. 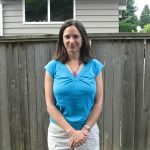 One of the new and exciting features on the site is an enhanced search function for our Washington state directory of global development, which allows users to drill down to the finer points of the issues and regions they care about when seeking out organizations, academic centers and businesses with a similar focus. In addition, you can explore the directory using our new interactive map function, and click in to your country of interest to see who is working there. Later next month we’ll also be rolling out Global WA Connects, which will serve as the primary online meeting place for discussion and collaboration for the global development community. We’re excited to enhance our role as a convening place for all the great work you are doing and look forward to new ways to help you connect. “Hope,” according to Roy Prosterman, Rural Development Institute’s founder, “is the catalyst from which all sustainable economic development and poverty reduction flows.” And for the rural poor, RDI sees land as hope. Secure access to land, even a tiny plot, means a poor person can help feed herself. It means she has the incentive to develop the land, to add a greenhouse, to find a way to irrigate it, if needed, to use sustainable fertilizers. It means she has a chance to take care of and educate her children. It means she has a place or an address in the world where she can be found. It means she can start a small business. It means she has status in the community. Most critically it means she sees herself as a person with options and with hope in the future. 400 million people now have access to land rights as a result of RDI’s efforts, working in partnerships with governments and many organizations. That’s one out of every 16 people on the planet touched by RDI! Of course, not all of the four hundred million have been able to take advantage of the changes. The road to successful implantation stretches far into the future. But still, what a story! This work is not dropping off a bag of rice on the edge of a village, though that work is important. Securing complicated legal changes require governments to buck vested interests and people to change hundreds of years of self perception, as well as years of patience and persistence. For the past 40 of those years RDI has been working with governments and NGOs across the developing world advocating land reform as the key change needed to promote economic development and social justice. Essentially a law firm whose clients are developing countries and NGOs, RDI advises governments about how to reform land laws so that the poor have the means to ensure their own future and thus have a stake in the future of the country. Today, with a home office in Seattle, RDI has a staff of 11 attorneys, with a total staff of 52, and field offices in Beijing, China; Bangalore, India; Hyderabad, India; Kolkata, India and Bhubaneshwar, India. With support from donors such as the Bill & Melinda Gates Foundation, Omidyar Network and consultancies for clients such as the World Bank and USAID, RDI is active in seven to ten countries at any one time. Roy Prosterman, a professor at the University of Washington School of Law, started working on land reform in South Vietnam. Between 1970 and 1973 his famous Land to the Tiller project helped over a million tenant farmers gain control over their land. Viet Cong recruiting plummeted in the area where the project was operating. Moreover, after the war, the Vietnamese government adopted Land to the Tiller principles to reform land ownership rather than collectivist principles. Rising from the ashes of the Land to the Tiller program, RDI was heavily involved in former Soviet block countries after the fall of the Soviet Union, advising new governments about what to do with the collective farms. RDI says that most of those efforts have been successfully implemented. Usually, RDI is invited either by the government, an NGO or a government agency such as USAID to provide analysis about how to change a particular country’s land law. Usually RDI’s funding comes either from contracts with NGOs or government agencies in the developed world. At other times, RDI does research and goes into a country on its own with the help of private donors. In all instances finding a person in the government willing to sponsor securing the legal changes is the critical variable that determines whether the project can get off the ground or fail. 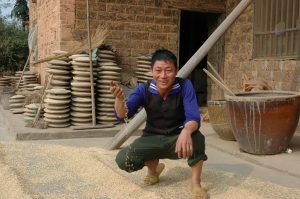 The 1998 land reform law passed by the Chinese government, with the advice of RDI, which gave rural families 30 year documented right to lands lead to skyrocking agricultural production and reduced China’s rural poverty index by 50%. Even though only about 40% of China’s eligible rural poor had actually received contracts by 2005, those efforts removed China from the list of major contributors to the world’s poverty index. By 2005, 46% of Africans and 30% of South Asians lived on less than a dollar a day, while in China the index decreased from 33% to less than 17%, a testament to the Chinese government’s efforts to reduce rural poverty by taking land reform and other methods of development seriously. In Rwanda, RDI is developing regulations, writing pamphlets and putting on plays that explain citizens’ rights under the new land law rights or that demonstrate the processes and evidentiary requirements for resolving land disputes. Taking gender issues into consideration, RDI is working with the Rwandan Women’s Law and Policy Task Force, an umbrella NGO that advocates on behalf of women’s rights. In Burundi, RDI is making recommendations to the government on ways to avoid the small amount of available land from flowing into the hands of the wealthy elite. In 2007 Angola, RDI completed a major study of how a land dispute resolution mechanism and formalized land rights could assist in the reconciliation of Angola. Unfortunately, RDI has so far been unable to find the required partner in the government to conduct a pilot program there. Major reform need not involve a lot of land. In India, RDI has worked with the government in four states to pioneer distribution very small plots — as small as 1/10th of an acre, or 5000 square feet, that’s the size of a normal Seattle city lot — to the rural poor of through grants and purchase programs. What good is micro-owning? On such a plot, a former bonded laborer, who once worked on his master’s lands for only his food, a primitive hut and $16 a year in return, can grow 90% of his family’s vegetable and fruit needs. From what food the family doesn’t eat themselves, they can earn $133 a year and additional $67 a year from raising and selling chickens and eggs. They can grow 42 teak trees, which, when mature, ten years from now, will sell for around $556 each or a total sum of $23,333, an astonishing sum someone who was an indentured servant just a few years before. Major reform does not require expropriation of private lands. In fact, RDI finds such heavy handed methods to be counterproductive. Better to enter into market solutions, buy the land and avoid the controversy. In India, the plots were purchased by the government for as little as $200 apiece. What major reform does require are years of patient advice, focused implementation and the understanding that every country is different. What was successful in the last country RDI worked in might not work in the next one. But forty years of effort, some successful, others not, means that the organization has history in its own files. RDI is turning those files into a major new undertaking. 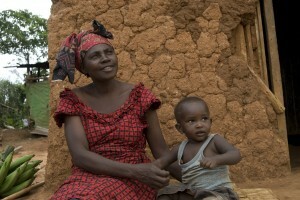 Scheduled to open in October, 2009, RDI will launch the Global Center for Women’s Land Rights. The Center will operate an e-library that will catalogue developing country laws that affect women’s land rights. Those materials will be available 24/7 on its website, providing an invaluable and free resource for land reform efforts across the world and bringing together the global community around the issue of secure land rights for women and girls. 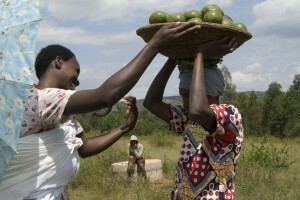 RDI understands that women are central to successful land reform and poverty reduction. Upwards of eighty percent of rural land is tilled by women, but less than five percent of this land is owned or controlled by the women who till it. Based in Seattle, the Center will be a source for training and advocacy, provide scholarships to bring people from poor countries to the Seattle (based in part on iLeap’s visiting scholar program which was described in the June Global Washington Newsletter) and fellowships to send scholars see how land reform really works in country. 40 years of work, in 45 countries, for 400,000,000 rewards is an astonishingly successful. A voice for community-based water projects across the developing world, Marla Smith-Nilson is the Executive Director of Seattle-based Water 1st. Water 1st directs its annual $1 million fundraising prowess to water projects that are planned and operated by the people they serve. Since 2005, Water 1st has provided funding for non-profits who have built more than 251 projects that are benefiting over 30,000 people. Although Marla is a civil engineer, Water 1st does not perform the engineering design for the water projects, but they do provide technical oversight and help to introduce partners to new technology they may not have had an opportunity to see. 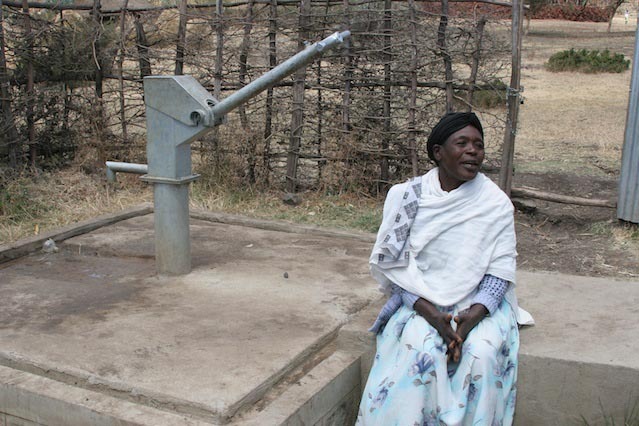 And although she is a community organizer, Water 1st does not organize water projects in the communities it serves. Instead, Water 1st’s mission is to fund local organizations’ efforts to educate their own communities in sustainable acquisition and use of safe water and to educate people in the developed world about the need to help fund these local efforts. Water 1st doesn’t swoop in, build a project and leave. 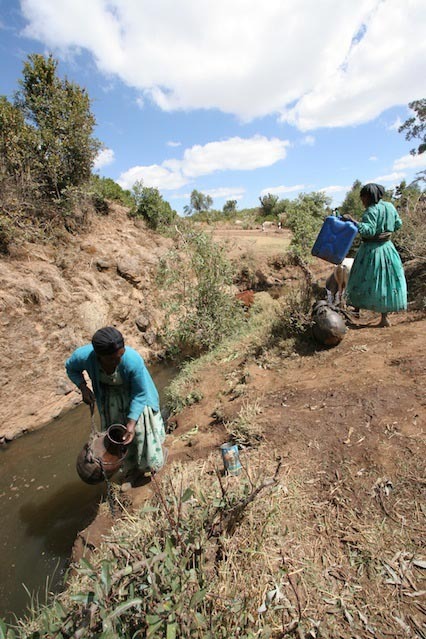 For these reasons, Water 1st projects are not likely to result in a million dollar water project lying inoperable for lack of a part, or unused latrines that no one was ever taught how to use, or water that is wasted because no one is responsible to pay for it. Stepping back to be supportive rather than directive doesn’t mean that Water 1st doesn’t require stiff standards. More on that later. First, the story that led Marla to this work. As a child of American school teachers living in Arizona, Marla Smith-Nilson spent her summers camping and fishing just across the border in Mexico. One of her earliest memories is of questioning her mother why Mexican children her own age were carrying water to their homes from a stream. Her mother pointed to the luck of her birth and told her she should be thankful that she was not one of those children. Over the years the comment became less of an explanation than a challenge. Some things there were no solutions for, but this seemed so easy. Just simple engineering: a pipe and a water source. Growing up in water-parched Arizona also has a way of keeping water issues personal. In college at the University of Arizona and in graduate school at UNC at Chapel Hill, Marla turned to civil engineering expecting it to become her vocation. 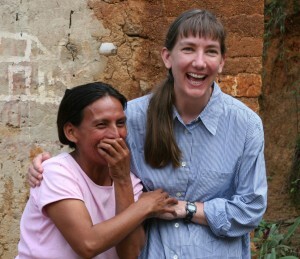 As a graduate student working on a civil engineering project in a village in Honduras in the early 90’s, she learned about another locally-based and staffed non-profit trying to bring clean water to the village. It only needed $5,000 to take off. It seemed like a sum she could raise. The project wasn’t likely to happen if she didn’t do it, so she agreed to try. As she prevailed upon her friends, family, fellow students and faculty to give money, she was learning her first lesson in how to effectively deal with the water and sanitation crisis in developing communities. Local NGOs have access to civil engineers. They already have the knowledge to bring clean water everywhere they work. The local NGOs already have the trust of the community and the personal contracts to make such a project work. What they lack is not technical expertise, but a world that knows how few people in developing countries have access to that simple pipe and water resource and how simple the solutions would be if the money were there. It was a world that could be mobilized if it could be educated. Marla became one of the original founders of Water Partners International which today has a formidable budget of 3-4 million dollars. Based in three cities reflecting the dispersion of the founding students and faculty upon graduation, in its early days it had a similar focus on using local NGOs to organize water projects in developing communities. But as that organization became bigger and started receiving money from government and large foundations, Marla felt it was starting to lose its focus on building a grassroots base of support for its cause. 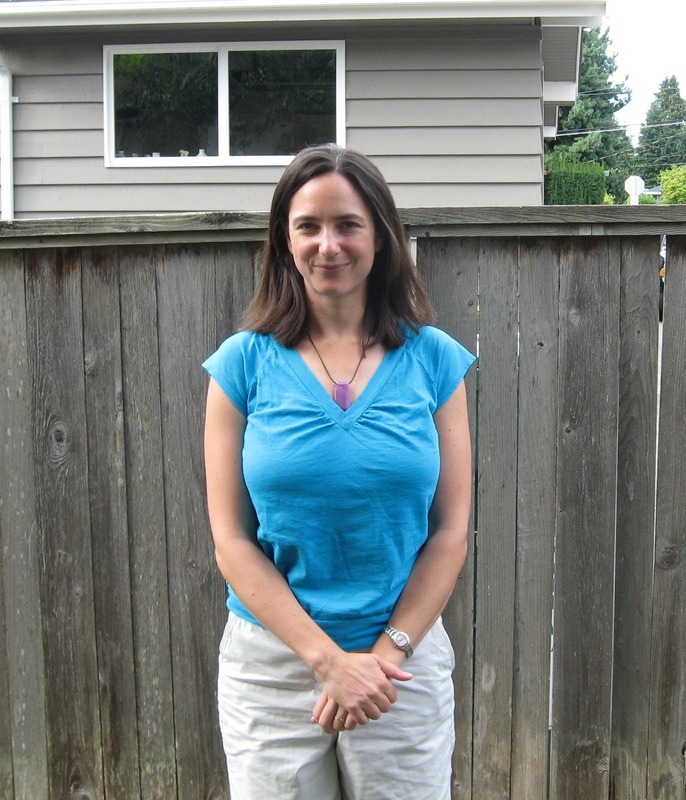 After trying to change the focus from within, Marla and the rest of the staff from the Seattle office left the organization and created Water 1st in 2005. Today Water 1st’s projects in Ethiopia, India, Bangladesh and Honduras appear as models of well-run community-based water systems. In each case the community was involved in helping identify the problem and coming up solutions. Each community was also required to bear a portion of the capital and all of the operating costs of the project. All the projects were managed by a local board that coordinated with the NGO or local government. The fruits of this organizing extend beyond the water projects to other problems the communities now realize they can solve. The communities of Ilamu Muja, Ethiopia and San Gabriel, Honduras, beneficiaries of Water 1st funding for their water projects, have now built elementary schools. People living in the slums of Dhaka, who used to buy water from expensive, illegal private water vendors, now have more money for their families. Women in India have formed local savings groups to take out small loans and start small businesses. Water 1st’s vision states that “providing people with safe water is the first step toward breaking the cycle of poverty.” The community-based organizations are moving on to the next steps; Water 1st is learning too. It is also introducing metering into its projects in Honduras and expects to bring its NGOs from other countries together so they can learn from each other. 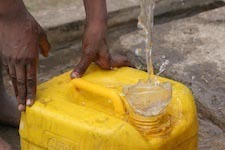 Water 1st expects to move on to new partners as well in 2010 and 2011. Waterworks fundraising efforts include Water 1st tours of communities that are either developing water projects or in need of doing so. It has an annual dinner in November for its majors donors with some corporate sponsorship, but 75% of its donors are individuals. Carry 5 campaigns, a variation on walkathons, are being virally organized over the internet by supporters across the country. Local press accounts of families carrying a five-gallon container a mile or two in the sun drive home the problem. As for accountability, besides educating the developed world and raising funds, Marla’s other principal role is oversight. Water 1st audits both the local NGO and the individual water project committees at least annually inspecting their books, their physical infrastructure and the effectiveness of their local management committees. It’s been a long way from that little girl’s wonderment at seeing children forced to carrying water. There’s still a long way to go. But thanks to Marla, the local non-profits with whom Water 1st collaborates, the communities that step up to help themselves, and the donors who learn the real value of their contributions, there is a process that works. What makes a smuggler, a smuggler? Taxes. Otherwise a smuggler is just a trader. Whether the purpose of the tax is to raise money, discourage competition or control the trafficking in dangerous products, the underlying activity is just commerce. That, at least, is the ethic among the traders. The line between the legal and the illegal, or what Nordstrom calls the il/legal is frequently hard to discern. In the face of people’s lives, arguments from morality are as likely to be shaken as confirmed. Trafficking in young children may retain its universal abhorrence, but recreational drugs? They are chosen. Counterfeit pharmaceuticals? Sometimes they are generic reproductions costing a fraction of the name brand and disparately needed in a conflict zone. Food products? Hard to oppose when people are starving. NGOs, government entities and businesses operating in developing countries will recognize much of what Nordstrom describes. The complicity of governments and “straight” businesses in the developed world might be a little less familiar. Nordstrom travels through Africa, Asia, Europe and the United States to tell this story. Two-thirds of all trade moves outside legal channels and ninety percent of it leaks through the shipping industry, according to both the police and import/export CEOs quoted by Nordstrom. One can argue that this massive undeclared trade deprives countries, developing and developed alike, of the funds they need to educate, feed and house their people. It also deprives them of the funds they need to wage wars and give tax breaks to the wealthy. For the most part the author doesn’t take sides, although she ultimately does admit to smuggled pharmaceuticals being better than no pharmaceuticals at all. Her book is descriptive, not prescriptive. The book begins with the story of an orphan who sells cigarettes on the street. He buys them from a small shopkeeper who also sells electronic goods and name brand drugs in the front of his store and weapons in the back. The trader’s goods come across borders through free trade zones, unstaffed border crossings, or slipped in among the bags of rice sent by an aid agency or among the weapons ordered by the local military. Electronic goods enter the continent at ports in containers under shipping documents that declare the contents to be one of the metals in the finished product. The name brand drugs, real or counterfeit, and weapons are brought in through fishing vessels that meet ships outside territorial waters. At each step Nordstrom describes how the sales occur, the nature of the relationship between the seller and the buyer, how the traders see themselves as well as how and why the entities of the state either cannot, or do not, intervene. Nordstrom explains why inspection at ports doesn’t and isn’t likely to happen in the future. The length of time it takes to remove one container from a ship, inspect it and repackage it is six hours; 24,657 containers a day are routed through the Port of Rotterdam. Delays in getting those goods to market give surrounding ports a competitive edge and result in harangues from both companies anxious for the delivery of their goods and government officials anxious to keep the anxious CEOs from becoming more anxious. Shipping agents in London casually discuss with Nordstrom the going rate for smuggled goods which they would happy to arrange for her should she wish, and ships crews explain how they routinely take a cut of the ship’s costs, unbeknownst to the owner. Tax avoidance in developed nations gets equal time. The chapter on how easy it is for a business to buy a bank, a name change and a second citizenship in order to launder money with impunity is truly eye-opening. There are websites that offer all these activities at listed prices. (If Homeland Security is truly watching our internet usage one hopes they are focusing on these sites). No solutions are presented, nor is there an implication that a solution is needed. If there is an agenda though, it is her desire to show how much more complicated the situation is than most of us know. 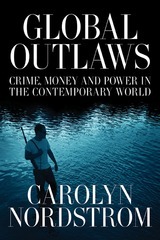 The book ends with the intersection of smuggling and security. If by this time the reader has begun to question whether international efforts at altering this global deception are worth it, she leaves her reader with the following caveat. Once you’ve figure out how the least dangerous goods are routinely smuggled into a country, say counterfeit Barbie dolls, you’ve figured out how the most dangerous goods can be. New Staff at Global Washington: Global Washington welcomes the newest addition to the team, Danielle Ellingston, as our Global Policy Coordinator. Danielle most recently worked for Congressional Research Service in Washington, DC, where she provided research and analysis to members of Congress and their staffs. Danielle’s research focused on issues in international trade and development such as trade capacity building and the African Growth and Opportunity Act. In addition, she completed rotations at the U.S. Agency for International Development West Africa Regional Program office and the U.S. Trade Representative’s Office for Trade Capacity Building. Previously, Danielle was a Peace Corps Volunteer in Ghana working as a small business advisor with pineapple farmers. Danielle earned her MA from the Johns Hopkins School of Advanced International Studies, in Washington, DC in 2003. Danielle originally hails from Brooklyn, NY and is a newcomer to the Seattle area where she enjoys rowing and hiking with her family. New Addition to the Global WA Family! We are thrilled to announce the birth of Frederick Sargent Barr, born August 3rd. He arrived at 9:15 am after 3 1/2 hours labor and was 21 inches long, 8lbs 9oz. 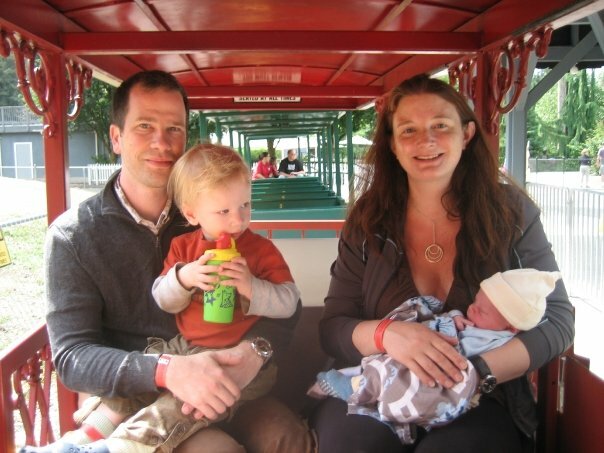 Frederick joins big bro Walter, 22 months, mom Katherine (of Global WA fame), dad Jonathan and kitty Hugo. Everyone is happy, healthy and adjusting to life together. Congratulations, Barr family! New Member Benefit – GrantStation Insider: Global Washington, in partnership with GrantStation, is now distributing a monthly e-newsletter to members that focuses on upcoming charitable giving programs and U.S. Federal agency grant deadlines for organizations working internationally. Current Global Washington members will see their first free GrantStation e-newsletter next week. You can read more about this fantastic benefit at the GrantStation website and check out Global WA’s other member benefits by clicking here. iLeap Invites Global WA Members to Participate in 2010 Fellowship Program: Due to the unique way in which the iLEAP Fellowship promotes meaningful, long-term collaboration among Global Washington members, iLeap: The Center for Critical Service is extending an exclusive invitation, in advance of their regular application period, for Global WA members to nominate and/or sponsor a Fellow on their 2010 International Fellowship program. Please click here to read the letter of invitation. Foster School Announces 2010 Global Social Entrepreneurship Competition (GSEC): The University of Washington Global Business Center at the Foster School of Business is pleased to announce the 2010 Global Social Entrepreneurship Competition (GSEC). GSEC is a business plan competition in which students from around the globe—and across fields of study—find creative, commercially sustainable solutions to problems of poverty in the developing world. As a leading-edge initiative at the University of Washington, GSEC seeks to engage creative minds across disciplines to encourage bolder and less conventional business solutions to global poverty. GSEC also engages individuals as mentors, judges, and sponsors; detailed information is available on the GSEC website. Please submit your events to our calendar!